All family updates are included here: photo uploads/tagging, posted news, uploaded documents, newly added profiles and family, family that join, birthday and anniversary reminders, collaborators stories and much more. You may post news here, upload and share photos, send a gift and More! Merge Issues: The number of merge issues in your Family Group and profiles you manage. Links to a list of issues so you can resolve them. See Resolving Merge Issues for a detailed description on how to deal with these. Requests: Received requests from other Geni users, may be merge, collaboration, family group or friend. Received Gifts will also show here. Use this module on the Home page to easily invite those family members to the Tree and your Friends that you have not yet included. These are the top and most recent featured profiles on our Popular Profiles page. Is a smaller, more condensed version of your main Statistics page. 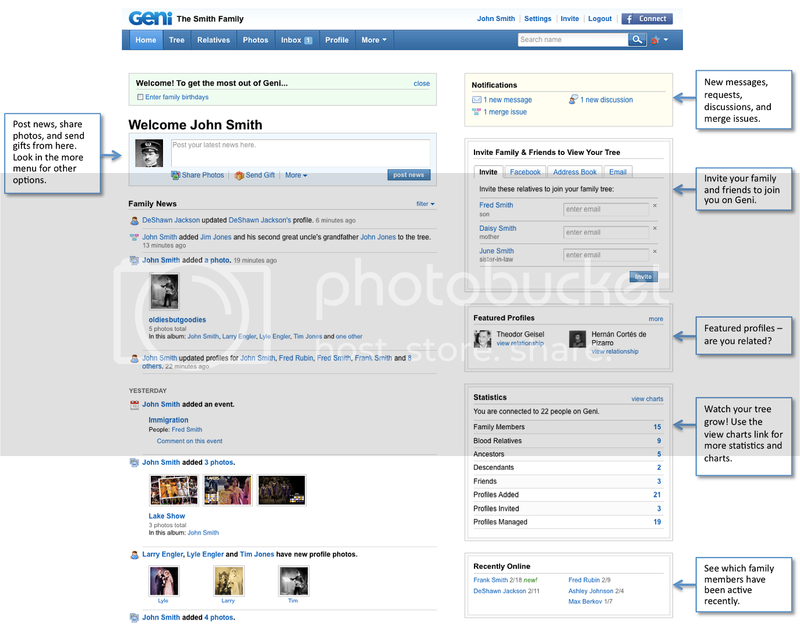 The module shows how many users you are connected to on the Geni site. These are those Family Group members and friends that have accessed the Geni site recently. The date is shown next to their name so you can see how recently they were online on Geni. This page was last modified on 26 March 2010, at 16:04.